About 10,000 Baby Boomers turn 65 every day, and the number of seniors is expected to top 70 million by 2030. To help meet the needs of an aging population, the UCSF Division of Geriatrics is pioneering ways to providebetter care to older adults, discover better therapies, and educate the next generation of medical professionals, caregivers and community members. “We are passionate about caring for older persons across the full spectrum of aging, and are proud to lead improvements in clinical care and public policy that enhance quality of life for older adults – ranging from the healthiest to the frailest seniors and their caregivers,” says Louise C. Walter, MD, chief of the Division of Geriatrics. One of geriatricians’ most powerful tools for providing coordinated care in a fragmented health system is a team approach that integrates the complementary expertise of nurses, physical therapists, nutritionists, social workers and many others. “What we’ve learned in geriatrics is that often a problem is not a result of one issue, but five or six,” says Christine Ritchie, MD, MSPH, the Harris Fishbon Distinguished Professor in Clinical Translational Research and Aging and director of the UCSF Program for the Aging Century (please see story on the back page). “When you address these multiple issues all at the same time, you’re much more likely to improve someone’s outcome than if you only address one. With a patient who falls, if you adjust their medications, engage them in strengthening exercises from a physical therapist and address home safety issues, that’s going to be much more effective than if one person says, ‘Do X.’” While the challenges are immense, this is a time of unprecedented opportunity. Many groundbreaking geriatrics programs started at the San Francisco Veterans Affairs Medical Center (SFVAMC), which has been closely affiliated with the UCSF School of Medicine for more than 35 years. 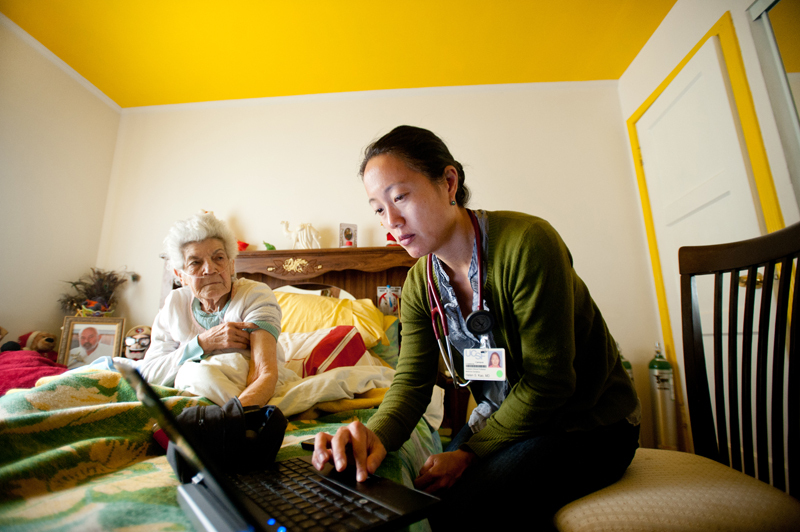 Because the SFVAMC is responsible for patients whether they are hospital-ized, in a nursing home or living at home, it has developed many programs to keep them as healthy as possible across every care setting. Similarly, under health care reform, the country is moving to more inte-grated models of care, and the Centers for Medicare and Medicaid Services is beginning to hold institutions financially accountable for patients’ outcomes. “As organizations become responsible for the continuum of care, geriatrics can serve as a national model for how to best provide this Populationcare,” says Ritchie. 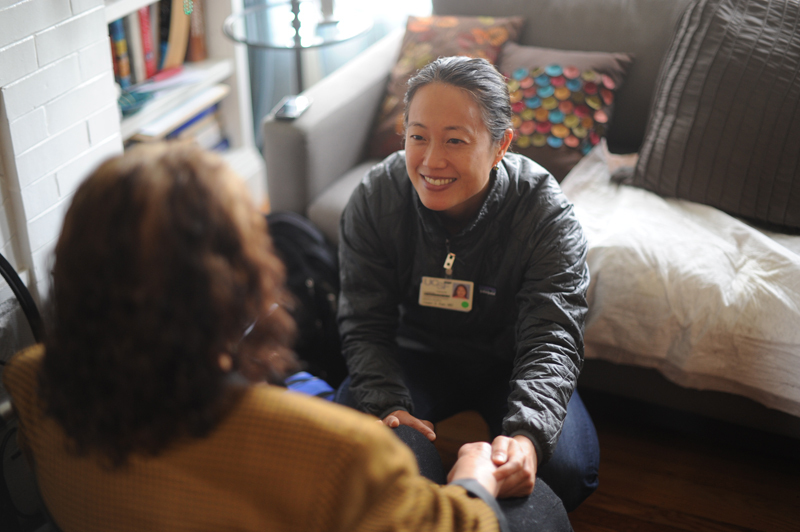 For example, UCSF is piloting programs that send a team of doctors, nurses and other health care professionals to the frailest patients’ homes, providing care before conditions become urgent. “Our analysis shows that hospitalization rates decline substantially when patients are enrolled in our Housecalls program, generating substantial cost savings and providing better care,” says Ritchie. “Patients are happier, they actually do better, and they need less of some of the things that are the most costly. It’s the right care at the right place, at the right time.” The UCSF Division of Geriatrics and the Program for the Aging Century are developing many novel pilots to improve patient care, increase the evidence in support of the care provided and better educate health care providers to care for our aging society. To provide extra support for the many older patients at San Francisco General Hospital (SFGH), Edgar Pierluissi, MD, and geriatrics fellow Anna Chodos, MD, established a computer-based consultation service allowing primary care physicians to receive guidance from geriatricians. 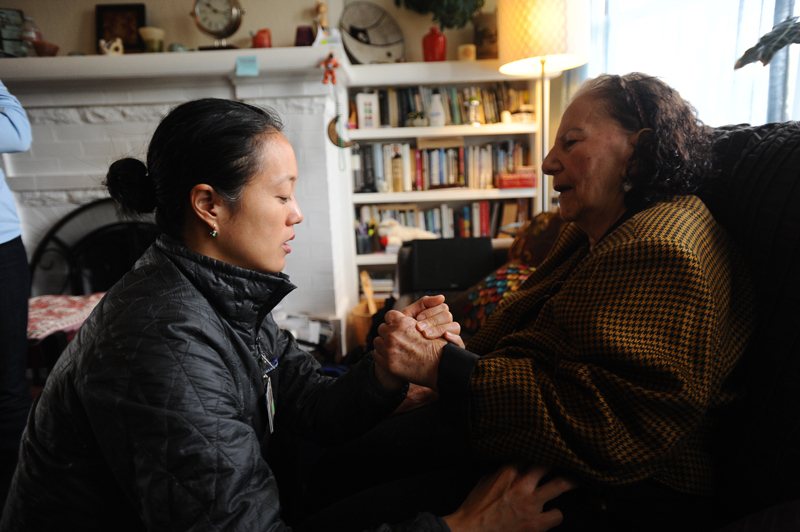 For more complex issues, SFGH recently established a geriatrics clinic open on Saturdays.